Gloria Steinem, right, speaks with shoppers during a tour of Co-op Market on June 12th. 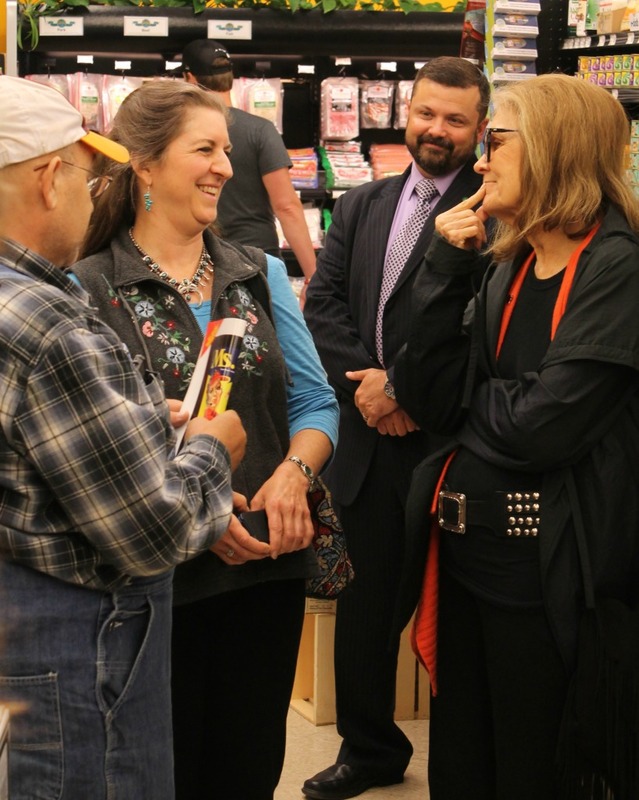 In June, noted feminist and civil rights activist Gloria Steinem visited our co-op. She was in town to speak at the University of Alaska-Fairbanks. Grocery team leader Shaun Sims gave her a tour of the store and spoke with her about our history. They also talked about the cooperative principles and the values that guide us. Some people have wondered why we didn’t publicize Ms. Steinem’s visit. After all – as she herself said – she probably wouldn’t have visited Fairbanks without last year’s controversy over whether we should sell Ms. Magazine. She founded that magazine. As a co-op, we want to bring people together. We do this by focusing on our mission: Providing good, healthy food to our community. Everyone wants healthy food. It is the one thing that bridges all divides – social, cultural and political. Our Owners, customers and employees hold many different political and cultural views. We serve people who are liberal, conservative and everything between. We want everyone in our community to feel welcome. As a co-op, this means we must remain politically neutral on all issues except food security and safety – no matter what our own individual views are. We admire Ms. Steinem for her decades-long commitment to ending discrimination. Her work echoes the goal of the First Cooperative Principle. While we are inspired, we are also aware that many of our Owners, shoppers and employees do not share her political and social views. Everyone is welcome in our co-op, so we were distressed that so much of the publicity surrounding Ms. Steinem’s visit to Fairbanks focused on last year’s conflict – and much of it ridiculed one person. We believe everyone has a right to an opinion, and no one should be belittled for his beliefs. We were saddened when we lost Owners last year, even as we gained new ones. We didn’t feel that anyone had “won” the argument. Instead, the conversation was cut short. And we learned how important it is to focus on our mission. At the co-op, we like to say that we are “big enough to meet your needs, and small enough to meet your neighbor.” In this small community, we meet each other every time we venture outside our own doors. We believe it is so important to remember that, in the end, we have much more in common than not. A final note: Ms. Steinem learned a lot about our co-op’s history. We told her how the successful, busy store of today started out as just a dream shared by a handful of people. In the face of many obstacles, despite a lack of any real grocery experience, those people persevered and were joined by many others. All put their faith in the shared vision of a healthy cooperative grocery store. After many years of sustained dedication, seemingly against the odds, we did it: We opened our doors and welcomed the community in, and we’ve learned and grown ever since. Ms. Steinem was impressed by our history, by the vision and the tremendous amount of organization required to make it come true. She told us she works with a group that facilitates workshops for organizers. Before her visit to Co-op Market, she had never considered including cooperatives in these workshops. Her experience here changed that. She said she believes co-op organizers have a wealth of experience to share and she hopes to include them in future. We agree and hope to hear more. *Like cooperatives around the world, Co-op Market operates according to the core principles and values adopted by the International Co-operative Alliance in 1995. Co-ops trace the roots of these principles to the first modern cooperative founded in Rochdale, England, in 1844. For more information on the 7 Cooperative Principles, click here.